Miami Beach is known for its glistening sands, sparkling waters, and exciting nightlife. For that reason, many people flock to Miami Beach and call it home or their second home. With that being said, when seeking to purchase a property in Miami Beach, everyone’s priority is to purchase a waterfront home to have easy access to the bay and ocean. Contrary to popular belief, not all homes in Miami Beach are waterfront homes; so let us help you discover some Miami Beach neighborhoods with the best waterfront homes in Miami Beach. North Bay Road features some of the most exquisite waterfront homes in Miami Beach. Residents who are lucky enough to call this neighborhood home, can enjoy the serenity of a family-oriented, exclusive neighborhoods all within a short drive to South Beach or Greater Miami. North Bay Road is an ideal place for active families and individuals to seek a Miami Beach waterfront home because it is close to many locations for outdoor activities such as the beach, parks, and other recreation options such as tennis courts and golf courses. Additionally, North Bay Road is great for people who love living in a single-family home, and enjoy the privacy it affords them. Pine Tree Drive, with its’ beautiful pine trees and foliage, is one of the most picturesque neighborhoods in the Miami Beach area. 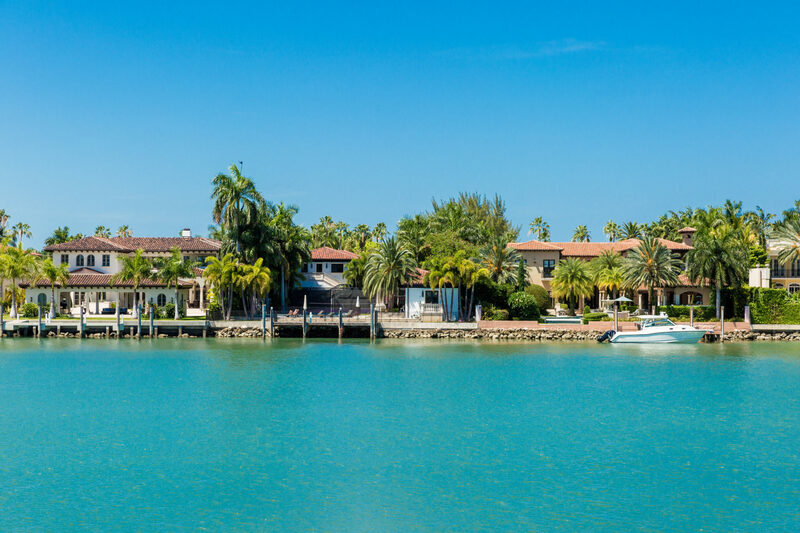 This family-oriented neighborhood offers residents stately single-family waterfront homes with lush yards, pools, pool decks, tennis courts, and basketball courts. This Miami Beach neighborhood is centrally located, and is just off West 41st Street, which contains the beach to the mainland via I-95/Julia Tuttle Causeway. This neighborhood is ideal for people who like to explore both close and far from home, thanks to its accessibility to the beach and the mainland. Normandy Isle is situated in Biscayne Bay just across from the North Beach Section of Miami Beach. This Miami Beach neighborhood connects to the mainland at the 79th Street Causeway and 71st Street on Miami Beach. This is a great neighborhood for families and offers buyers gorgeous waterfront homes with awe-inspiring views and completely unobstructed water access to both the bay and the Atlantic Ocean. This neighborhood is close to the beach, an array of parks, and has its own golf course, making this neighborhood a great choice for anyone seeking the classic Miami Beach life of sun, fun, and sea. If you are interested in visiting properties in North Bay Road, Pine Tree Drive, or Normandy Isle within Miami Beach, then contact us at pobiakproperties.com, and we will be more than happy to show you the Miami Beach waterfront homes that are currently on the market. This entry was posted in Lifestyle, Luxury Homes, Miami Beach Lifestyle, Miami Beach Neighborhoods, Miami Beach Real Estate, Miami Beach Waterfront Homes, Miami Beach Waterfront Neighborhoods, Miami Neighborhoods and tagged Miami Beach, Miami Beach Neighborhoods, Miami Beach Waterfront Homes, Miami Beach Waterfront Neighborhoods, Pobiak Properties on January 19, 2017 by Giancarlo Bobbio.